“Didn’t we just do a games of the week post?” You may ask yourself. Yes, well-intentioned reader, we did BUT there are even more great games in the universe than last week so we must soldier on. Here are our picks of games you should play this week. Lena Raine has already made a name for herself as an accomplished musician in the indie games space. You may have heard her work in games like Celeste or Hackmud, or any of her many standalone albums. Now Raine has expanded her skillset to include game development with the release of ESC. ESC is a game about navigating the remnants of a depreciated form of the internet while learning about the people who lived their lives in this old world. It’s a sort of cyberspace detective tale that is just as much Her Story as it is Gone Home. 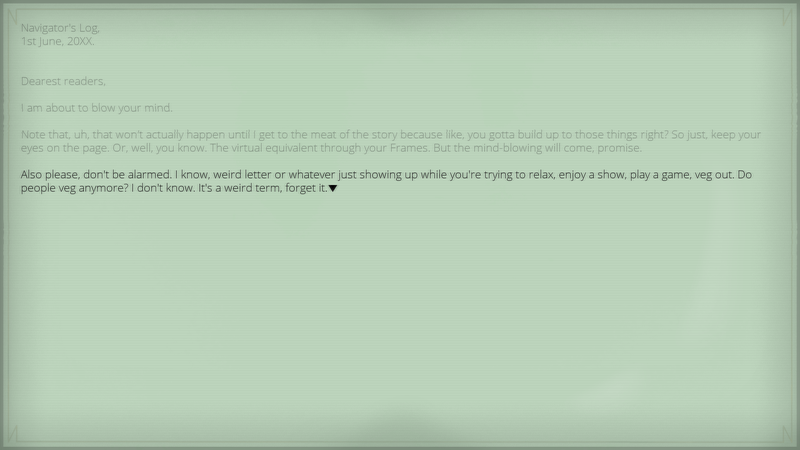 The game moves at a brisk pace for interactive fiction and Raine’s writing and music are accompanied by the works of a verifiable dream team that includes glitch-art superstar DataErase, sound design from 2 mello, and a ton of other exceptionally talented folks. ESC takes the burgeoning interactive fiction genre and builds on it in a ton of really interesting ways. Also it’s only $5 so, y’know, get it instead of coffee today. I would never have described myself as a fan of horror games recently, but I keep finding myself playing and enjoying them. This time I’m being scared speechless by the remake of last year’s Pacific, First Winter. 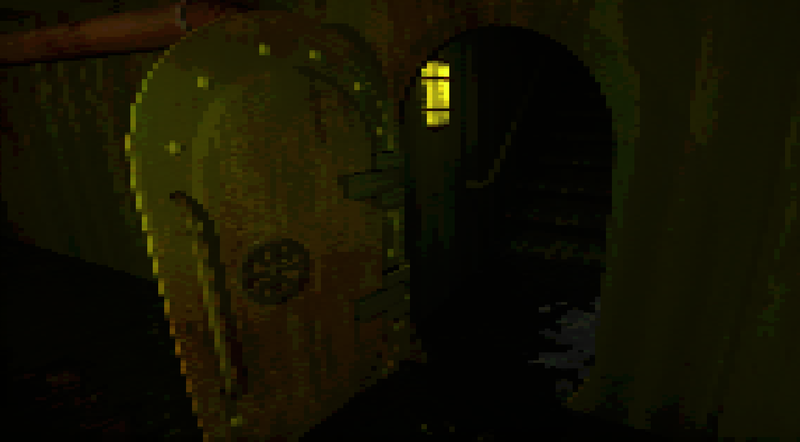 Billing itself as “submarine retro horror” First Winter borrows the structure of 90s horror games through its backtracking and puzzle-solving, but modernizes the puzzle design to be less obtuse. First Winter also lays a thick filter over the world that pixelates its visuals but is still crisp and legible. Imagine if Resident Evil 2 was developed with modern technology. Fortunately First Winter also solves one of my chief complaints with horror games: their length. Designed to be played in one sitting, First Winter keeps the pacing tight and respects your time enough to get its point across and then roll the credits. I didn’t need any more or less First Winter and that’s a feat rarely accomplished in games. Sending cards is an artform I’ve yet to master. The presence of an aisle at Target filled with thousands of pre-written cards leads me to believe that people are sending and receiving the things on a daily basis but I’ve only sent a handful in my life. From Ivan is helping me make up for lost time by setting the player as a newly minted Human Resource Manager who is responsible for maintaining morale via increasingly specific not-Hallmark cards. Yes, it’s hilarious. 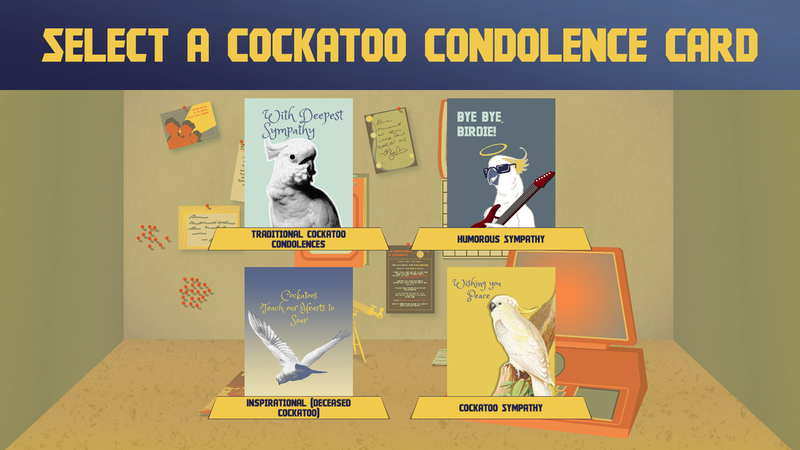 One of my favorite instances in the game (and one I wish wasn’t spoiled on From Ivan’s game page) was choosing a condolence card for a dead cockatoo. Once I sorted that out I knew I was ready to send cards in real life. From Ivan is also a companion piece to the similarly funny Cosmonet. Try them both out now.